The recommended reading is just two articles, even though each is fairly long. We have prepared a reading pack, including a timeline of events. Click here to download. – ‘A hope unfulfilled’: David Broder writes on the disappointed revolutionary aspirations of the WWII-era left. The article is about both France and Italy, with some general context as well. 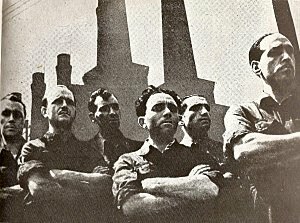 – ‘The left wing opposition in Italy during the period of the resistance’: Arturo Peregalli on the left-communist opposition to the Communist Party’s ‘national resistance’ line. (Part of a study of the far left: see long version here). Doing the reading is not compulsory, although we find the discussion is more participatory and better-informed if people try to come prepared.